Even for veterans of the power sector, the pace of the energy transformation can astound. Fowke’s utility company serves more than 3 million electricity customers across eight states from Michigan to New Mexico. Last week, Minnesota regulators approved a portion of Xcel’s wind energy expansion in the upper Midwest — a total investment of 1.55 GW of wind that also includes Iowa and the Dakotas. That plan is part of a larger Xcel initiative to add more than 3 GW of wind across its service areas in the coming years. Back in March, Fowke framed Xcel’s power mix evolution as a shift away from its traditional focus on coal-fired generation and toward wind, solar and natural gas. 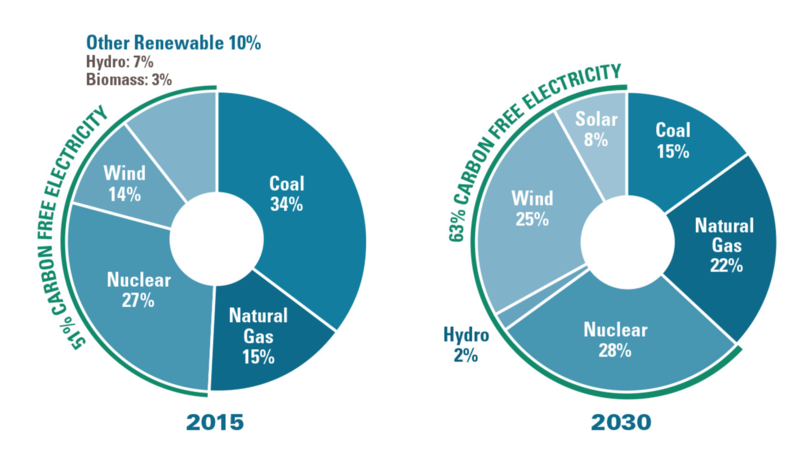 By 2021, the utility expects wind will be its largest energy source — not in terms of capacity, but actual generation. By 2030, Xcel expects wind generation to top 35% of its total energy mix, including 25% of its Upper Midwest capacity, as depicted above. Xcel calls it “steel for fuel” — swapping out fossil generation for fuel-free wind and solar. At today’s prices, “everybody benefits,” Fowke said. Consumers get lower-cost energy and Xcel can earn a rate of return for building wind projects. Xcel plans to own 1,150 MW of its latest 1,550 MW wind expansion. Wind is Xcel’s current focus, as the production tax credit for the resource will phase out over the next few years. After that, the next resource to add value to Xcel’s grid will likely be another renewable — solar. “We wanted to capture the production tax credits … Then I think you start to pivot to what's next,” Fowke said. “I think what's next will be taking advantage of the steady improvements of solar technology, particularly large universal solar. The tax credits will still be there in 2020, and perhaps it's an opportunity for us to lock in again tremendous prices for our customers as we continue to transition to this carbon-light world." Those investments will help Xcel make good on its pledge to cut carbon emissions 60% by 2030, but getting there will require the transformation of the rest of its resource mix as well. “We think we've been far more efficient with harnessing the wind that's on our system, not being overly conservative, having to curtail it often,” he said. The Xcel CEO expects the energy transition to continue regardless of the policy environment in Washington, D.C. President Trump's administration is in the process of rolling back a number of Obama-era environmental and energy regulations, including the Clean Power Plan, which governed carbon pollution from power plants. "Steel for fuel would make sense with or without a Clean Power Plan." Like other U.S. utilities, Fowke does not expect his companies to add new coal generation, but he said some companies could end up running old plants longer in the absence of carbon or other pollution regulations. The energy transition hasn’t been all happy headlines for Xcel. Earlier this year, environmentalists and consumer advocates slammed the utility for its plan to repower the 1.3 GW Sherco coal generator with 786 MW of new gas-fired generation. Xcel announced the retirement of the two Sherco units in its 2016 integrated resource plan, and regulators ordered a study on renewable energy alternatives to replacing the coal capacity with gas. Then, in January, the legislature stepped in with a bill that would authorize Xcel to bypass the regulatory process and build the gas plant without approval from the Public Utilities Commission. Environmentalists howled, calling it a “power play” by Xcel, but Gov. Mark Dayton (D) signed the measure in February. From Fowke’s perspective, the bill was not a utility ploy to circumvent its regulators, but rather an attempt by local legislators to ensure some power industry jobs at the Sherco site would be saved after the coal retirements. Fowke stressed that he thinks about decarbonization “continuously,” including how to contribute to the electrification of transportation and industrial processes. Despite regulatory rollbacks, he expects Xcel will be able to do its part to uphold the goals of the Paris climate agreement, which roughly translate to an 80% economywide decarbonization by 2050 — but he also knows it will likely take more innovation. “I think we can do it, but [with] the technologies today, to be 100% renewable, it doesn't work. That doesn't mean it won't be possible in the decades to come." At present, Fowke says Xcel continues to study the lowest-cost pathways to get to deep decarbonization. Correction: Ben Fowke's quote was updated to reflect that Xcel currently provides 6,700 MW of wind, not 8,000MW. The wind pricing quote was updated to reflect that he was referring to dollars per megawatt-hour, not cents per kilowatt-hour.